Have you ever stopped to think about the chemical interaction of perfumes and fragrances with our body? Or perhaps you or someone you know is extremely sensitive to an air freshener or scented lotions – ever wonder why? In this post we will discover what a fragrance is, why it’s an issue in personal care products, and how your body interacts with them. Have you ever gotten into someone’s car and been so overwhelmed with the air freshener that is gave you a headache? Fragrance is added to products to make them smell better (duh). Sometimes it’s to add a sense of luxury or personality. Sometimes they’re used to create a more “natural” aroma. And sometimes they’re used to cover up an offending odor. Scent sells and manufacturers know it, so novel fragrances are not only used in cosmetics, personal care products, and cleaners, they’re also increasingly found in hard goods like diapers, garbage bags, candles, tissues, toys, and more (Honest). 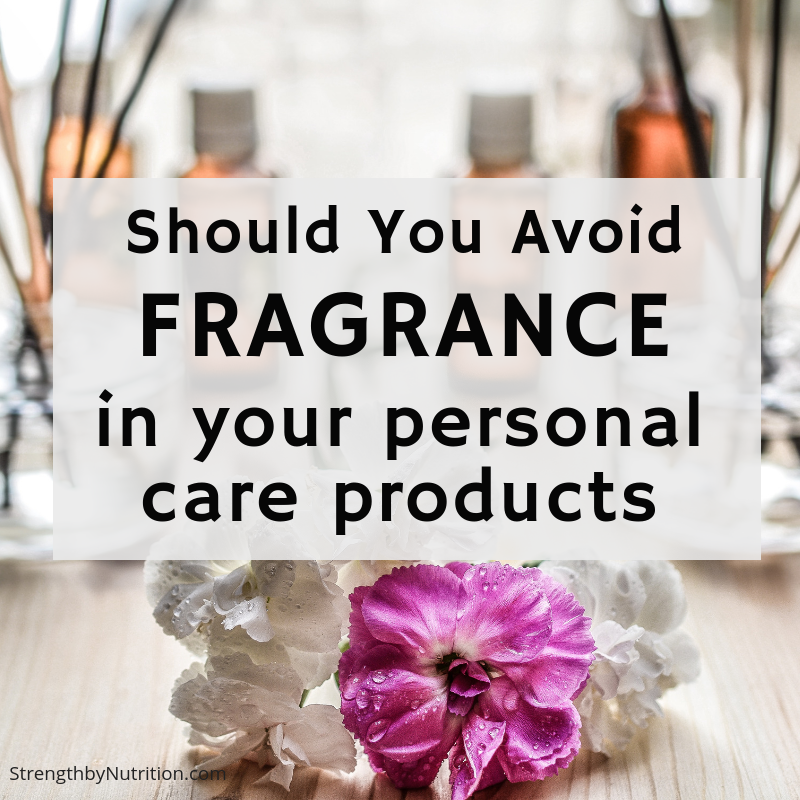 While every other specific ingredient used in personal care products must, by law, be listed on the label, fragrance is considered a trade secret (1). So, the dozens or perhaps even hundreds of chemicals used to create them are kept confidential from inquiring minds (Honest). Current laws do not provide the FDA with the authority to require disclosure or public safety of fragrance ingredients. In the U.S., companies are required to list ingredients on the label; however, this regulation excludes the individual constituents of fragrance in order to preserve fragrance trade secrets. This sustains a loophole that leads to disclosure gaps (Safe Cosmetics). Do fragrances pose health risks? Fragrance ingredients may be derived from petroleum or natural raw materials. Companies that manufacture perfume or cologne purchase fragrance mixtures from fragrance houses (companies that specialize in developing fragrances) to develop their own proprietary blends. In addition to “scent” chemicals that create the fragrance, perfumes and colognes also contain solvents, stabilizers, UV-absorbers, preservatives, and dyes. Acetaldehyde adversely affects kidneys and the reproductive, nervous and respiratory systems (17). This chemical is listed as known or suspected to cause cancer in California’s Proposition 65 (18). Both the International Agency for Research on Cancer and the National Toxicology Program classify acetaldehyde as potentially carcinogenic to humans (19, 20). Benzophenone is linked to endocrine disruption and organ system toxicity (21), and experimental studies suggest benzophenone may lead to several kinds of tumors (22). Derivatives of benzophenone, such as benzophenone-1 (BP-1) and oxybenzone (BP-3), are potential endocrine disruptor (23). Benzophenone is listed as a possible human carcinogen under California’s Proposition 65(24). Simply put, read the ingredients label on products and if “fragrance” or “parfum” is listed, put that product back on the shelf. Honest: in their position stand, they claim to “never use artificial fragrances or hide ingredients from you behind the term “fragrance” or “parfum.” Instead, they do use essential oils in many of their products to give them a pleasant, natural scent. You’ll always be able to identify exactly what they use, so, if you have allergies or sensitivities, you can easily avoid any triggers.” You can check out their Honestly Free Guarantee of ingredients they will never use. Beautycounter: they’re committed to a health and safety standard that goes well beyond what is required by U.S. law. “Through their Never List™ and 5-step ingredient selection process, they’ve prohibited the use of more than 1,500 questionable or harmful ingredients from use in Beautycounter formulas, so you can feel confident in the safety of their products and trust that they’re as effective and indulgent as any other luxe shampoo, lipstick, or oil in the market.” They are my all time favorite and count on them for all my cosmetics and body care needs!